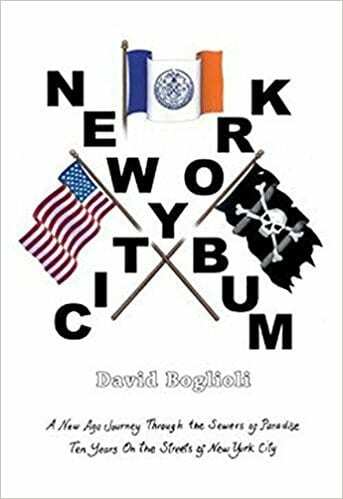 David Boglioli embarks upon an epic journey (and slide) from the throes of reality into the depths of debauchery in his latest body of work and personal account that details his ten-year achievement of becoming a New York City Bum. When asked to consider reading and reviewing this book, my initial pull to do so was the title. Titles are the essence of an anchor to hook the prospective reader into what lies between the covers. Moving beyond the title, it is key to have cover art that somehow ties to the title. The display of the American flag, flanked by a flag depicting a skull and crossbones was fitting, in my opinion, to the inevitable dichotomy of the tale that lurked beneath its cover. I rose to the challenge and settled in for a leisurely read of what Mr. Boglioli had to share. There is a formula Mr. Boglioli assumes in his writing of his ten-year experience living (most times barely existing) on the streets of New York in its bowels of drug-infestation, prostitution and down-right perilous situations. He steps the reader through his former life of being a renowned culinary perfectionist working for the Ritz Carlton only to sabotage his own livelihood and well-being for one more dance with crack. All in all, this is a telling of a tale that transcends across 500+ pages of situation upon situation and happenstance of how to live a life of nothing more than day-to-day and hour-by-hour survival with the notion of self-destruction being the only beacon on his horizon. This was an extremely difficult read for me to get through. I often set the book down for a day (sometimes more) to reinvigorate that inner person who is committed to reading a book and evaluating its content for two things: 1) does the story flow; and 2) does the premise capture my interest. I would say Mr. Boglioli wins high scores concerning the ‘capture my interest.’ Frankly, his annotations and colorful descriptions of his quest to become less than whole was firing on all pistons throughout. Where the story fell short was the flow. Mr. Boglioli clearly is well-spoken (and I would surmise well-read). However, for the lay person, some of the terminology used requires the companion of Webster’s dictionary to understand the meaning of the word and the context in which it was used: ‘…I was seeking to penetrate, to enjoin the meretricious world of the street… In that I strove inveterately as I needed…’ I’m all for the flair of descriptive prose, but found Mr. Boglioli was insistent to a fault to write at a level beyond 50,000 feet versus using a succinct and powerful punch with action figure verbiage to get his point across. I simply could not connect with the premise of his anti-establishment rant toward the general populace of normality to opt for a ten-year journey to pay homage to drug addiction. Quill says: New York City Bum is a demonstrative and slanted homage to the horrors of drug addiction and certainly not a ‘must read’ for the faint of heart.